Carson Russell, son of Jeremy and Melissa Russell of Rio Grande, pictured, is collecting items to be given out at Nationwide Children’s Hospital in Columbus to parents of sick children. Items like socks, toiletries and more are being sought for the gift bags. OHIO VALLEY — A five-year-old Gallia County boy, who has spent much of his young life in Nationwide Children’s Hospital in Columbus, has initiated a Christmas donation project, but the intended recipients might be a surprise to many. Carson Russell, son of Jeremy and Melissa Russell of Rio Grande, is collecting items to be given out at the hospital, but not to the children who are patients. Carson wants the Christmas gifts to go to the mommies and daddies who are sad that their children are hospitalized. Carson has been sick since birth with a rare condition that affects his organs. Although his specialists have conferred with other doctors and specialists around the country, nobody can figure out what caused the condition. The youngster has chronic lung disease, among other organ conditions, that has left one lung severely damaged. Because of the damage, he fights asthma and pneumonia regularly, and even a common cold can land him a hospital stay, according to his mother. Some of those hospital stays have been at Christmas time, when Carson and the other children have received gifts. But although the gifts pleased the boy, he asked where the presents were for his parents. Melissa said her son asked if Santa would be able to find him if he was in the hospital this year. She assured him that Santa would find him, but told him not to think about having to be hospitalized. Carson told his mom that his wish was to give presents to the mommies and daddies at the hospital. Melissa told her son they would pray about it, and that’s how the project began. So the family began collecting new items that will go into gift bags and be distributed to the parents. Each bag will include a handwritten, personal card from the Russell family, which also includes Carson’s seven and eight year old brothers. Items being collected for the bags are fleece socks, personal hygiene items, inspirational books and journals, lip balms, puzzles, hats and gloves, or money to buy those things. Gift cards are also being collected, as there is a Subway restaurant located in the hospital, and Papa John’s delivers there. Other restaurants are also nearby. Collection points are at three Gallipolis locations: Irvin’s Glass Service at 1273 Eastern Avenue; Canady Care, LLC, at 10 Old Airport Road; and the Russell family’s church, River City Fellowship at 252 Eastern Avenue. Items will be collected until Dec. 9. Melissa said she has had the experience, along with many other parents, when all you have are your purse and the clothes on your back when your child is admitted to the hospital. As for Carson’s current condition, his specialists completed a lung biopsy in July, and have started him on a medical trial of extreme doses of steroids. His condition is stable, and although he still gets sick, Melissa said the medicine helps him be hospitalized a lesser number of times. In the last five weeks, he has been sick twice, but was able to stay home. 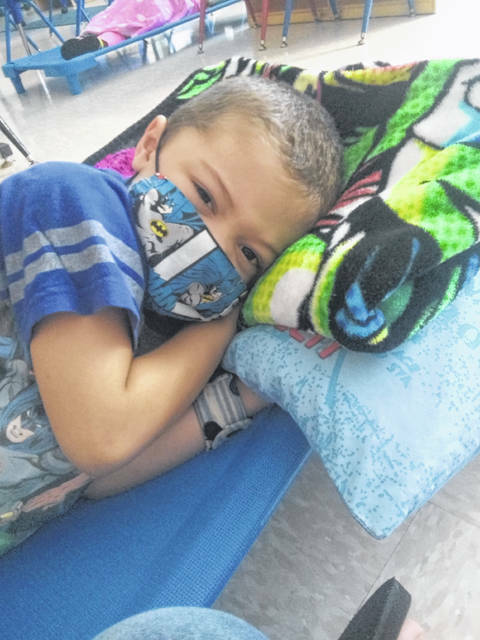 A pre-school student at Rio Elementary, Carson has to wear a medical mask to school, and his drinks have to be altered to keep him from aspirating the liquid into his lungs. Melissa admits she doesn’t like sending him to school, but wants to keep his life as normal as possible. And although Carson is sometimes self conscious of his differences, he loves having the friendships. Along with the support of his brothers, Carson also has great support from the other students at school. The first and second grade classes at Rio Elementary recently helped Carson’s cause by holding a “turkey trot.” The students got pledges for items for each lap they made in the trot. Last December, Carson actually spent more days in the hospital than at home. Melissa said she is often asked by friends and acquaintances how she does it, how she handles it all. For more information on Carson’s project, contact Melissa at 740-578-1225, Nicole Massie at 740-853-0416, or Barbara Williams at 740-446-4030. All donations will be used to make the gift bags.